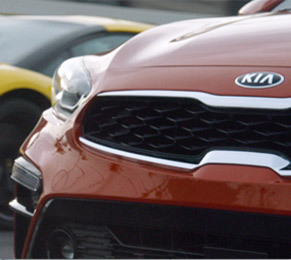 It is inconceivable to compare the compact Kia Forte with a Lamborghini, one of the fastest, flashiest, most coveted sports cars ever. So, that’s exactly what we did. We pitted the two vehicles as serious rivals, contrasting them in a side-by-side feature showdown at the Detroit Auto Show. Absurdity prevailed. By flaunting the features of the Forte, we left the Lambo in the dust. And, of course, once that dust settled, there were a lot of press to be read.